Mistakes - Ignore Them Or Embrace Them? "The mistakes you make are information of what you need to train next." 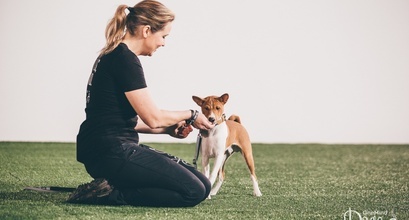 Watch a video of Leading OneMind Dogs Coaches Janita Leinonen and Jaakko Suoknuuti practicing independent weaves with their dogs! Things went a little differently with Janita’s young Border Collie MiG, who was in an accident when she was a puppy and it took a while for MiG to recover. Due to MiG’s history of a twisted pelvis, Janita had not wanted to practice weaves as much as she would have liked to. MiG and Janita started to compete 12 months ago. Some of the competition courses they have run recently required a lot of independent obstacle performance from the dog. Janita wanted to thank judges Heidi Viitaniemi and Eija Berglund, whose courses inspired Janita to finally teach the missing skills to MiG. It was not just MiG who got to try these challenges, but also Janita’s other dog Fu and Jaakko’s dog Dao got to do them! Thank you Heidi and Eija for the permission to publish these course maps! If you decide to try these challenges with your dog, we’d love to watch your videos! Share your training video on our discussion forum!